The mine as many of you already know, is fantastic. However, it is (amazingly) the first set I've purchased in 30 years of Lego-buying that has any kind of train track in it. I'd love to expand the track that comes with the set but I am woefully ignorant about Lego trains. Is this track the normal one that Lego trains come with? Can you get curved pieces? Crusader wrote: Is this track the normal one that Lego trains come with? No. A version of this type of track was sold with a much older type of train system LEGO used before the 9v system back in the 80's. Crusader wrote: Can you get curved pieces? Yes, they come in two sizes - inside and outside curve. You will need both sizes to make a useable curve. Thanks for the info, and thank goodness for bricklink. Crusader wrote: I'd love to expand the track that comes with the set but I am woefully ignorant about Lego trains. Is this track the normal one that Lego trains come with? Can you get curved pieces? My thoughts exactly! 7036 Dwarves' Mine is primarily what has just gotten me interested in legos again (after maybe 10-15 years, though I have to give some credit to the new pirate sets as well), it just captured my imagination. I LOVE the idea of a mine and the mine carts on a track. I want to expand it as well. I have one other set that has a pair of these straight tracks (slightly different gray though), which incidentally is another mine - 6761 Bandits' Secret Hideout (I got it off ebay after I got the Dwarves' Mine, mostly for the tracks! ). I had figured out from digging on peeron.com's inventory lists that there are some old train sets with blue tracks (straight and curved pieces), 4.5V system it appears. I followed the above suggestion and searched bricklink.com, and found a few listed there. Haven't bought any though. And I don't have any other lego trains either, so I'm new to lego tracks as well. 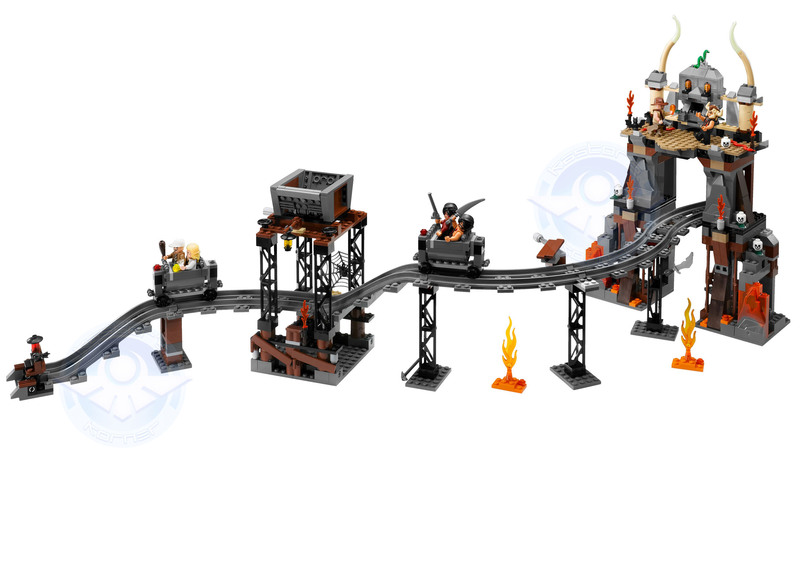 I also recently stumbled across some photos on flicker of upcoming 2009 lego sets, and it looks like the Indiana Jones set 7199 The Temple of Doom may also use the same track system (just based on the photos of course), and it not only has lots of curved tracks, but tracks that go up and down too (as in elevation changing)! The train wheels on the mine carts look like the same ones used in 7036 and 6761, so that would make me think the tracks could be the same system, and compatible. I really REALLY hope this turns out to be true, because if it is, this Indy set could greatly expand my Dwarves' Mine. Here's a link to the photos of this set on flickr.com (I think you have to login to see them). I'm really hoping to get this set sometime... mostly for the track! But the color scheme of the set looks similar to the Dwarve's Mine, so it shouldn't be hard to turn it into a castle set (no offense to Indy of course, but I'm just more into castle). I believe (correct me if I R wrong) that the new Temple Of Doom Indy set will come with a selection of the R/C standard train track, plus the first ever elevated grade train train track. The only interest this has to me would be contests at Brick-Con to achieve heaviest load WITH traction to make it up a graded track extension without slipping backwards, in various distance and speed categories. Other than that, aren't THOSE tracks a different animal from the ones included with the Dwarve's Mine (among others)? The old 4.5 track works with it (the toothy track), but it takes some work to move the pre-fab stuff into line with the separated piece stuff, don't it? We're talking bananas, apples and oranges here. Count Blacktron wrote: I believe (correct me if I R wrong) that the new Temple Of Doom Indy set will come with a selection of the R/C standard train track, plus the first ever elevated grade train train track. My dwarves are most eager to see who can quaff the most ale while riding a mining cart down an incline. Hey Sir Dano, thanks for posting a link to that pic! I was doing a custom dwarf mine, expanding on teh mine from teh set. the indy tracks are not compatible with the dwarf track. the dwarf track and carts have a 2 space space between tracks. the indiana jones set has 4 spaces in between, and is a different type of track. one thing i found dissapointing about the temple of doom track, is that it is not great for customizing, unless you set it up the way it shows on the picture. you cant put it on a baseplate, it has to be raised. the only way i could think to do it, is by using those little turntable things at the bottom, but the tracks like to pop off. i managed to make somehting cool, but it wasnt easy like i had hoped. i cant show any pictures, because i am moving at he end of the month and they are packed. dwarves mine was what got me back into legos for the first time since black falcons. really cool stuff lego has been putting out. heres hoping elves next year. maybe centaurs as their enemies? Badbriancool wrote: I was doing a custom dwarf mine, expanding on teh mine from teh set. the indy tracks are not compatible with the dwarf track. the dwarf track and carts have a 2 space space between tracks. the indiana jones set has 4 spaces in between, and is a different type of track. you are right, there are two spaces in between. i was going off memory. the problem is that they use a new locking system that makes it so you cant connect old tracks with new. the new tracks are solid without grooves, the old tracks have grooves and are different. Badbriancool wrote: you are right, there are two spaces in between. i was going off memory. the problem is that they use a new locking system that makes it so you cant connect old tracks with new. the new tracks are solid without grooves, the old tracks have grooves and are different. Thanks for the insight on these tracks!